Take a look at the picture at left of Joelle Aubron, a French woman just released from prison for health reasons (a brain tumour) after serving seventeen years for her murderous activities in Action Directe, the extremist left-wing group. 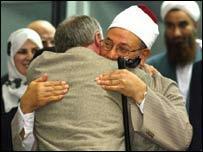 Jan. 11, 2005 update: "Red" Ken Livingstone embracing Yusuf al-Qaradawi makes another good picture of the red-green love affair. 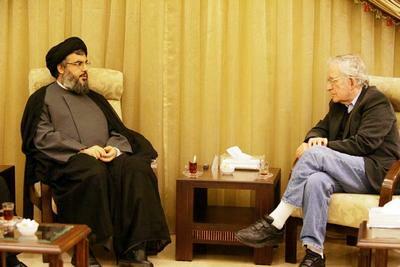 May 13, 2006 update: Here's another picture-perfect representation of the alliance: Noam Chomsky chatting with Hassan Nasrallah, leader of Hezbollah. 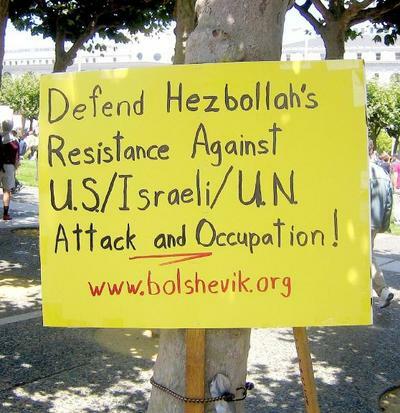 Chomsky announced to the press while at Hezbollah's headquarters that he supported its being armed: "I think Nasrallah has a reasoned argument and persuasive argument that [arms] should be in the hands of Hezbollah as a deterrent to potential aggression," a reference to Israel. July 20, 2006 update: The outside world is not fully aware of how very far-left is the prime minister of Spain, José Luis Rodríguez Zapatero, but it will soon enough learn. In the meantime, here is his statement of allegiance in a picture. Note that the kefiye's checkered pattern ends and a representation of the Palestinian colors follows. Aug. 12, 2006 update: A "Stop the U.S.-Israeli War" rally took place in San Francisco today and zombietime.com has a page of pictures, one more disgusting than the last, of signs carried at it. Here is one of the more innocuous, but very much in keeping with the gist of this weblog entry. 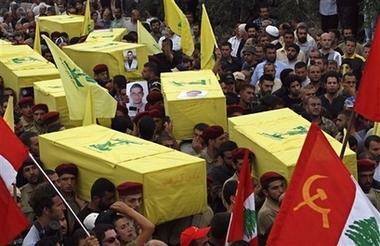 Aug. 18, 2006 update: A funeral procession for Hizbullah terrorists in Srifa, Lebanon, also included a send-off from some communist friends. 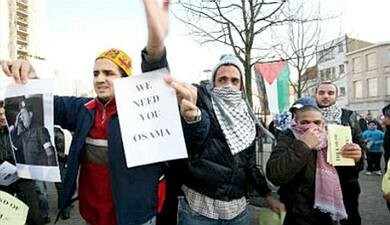 Jan. 1, 2009 update: In an anti-Israel demonstration organized by the Arab European League in Antwerp, Belgium, that turned into a riot on Dec. 31, 2008, a picture of Venezuela's Hugo Chavez is held aloft right next to a sign declaring "We Need You Osama." And, in an undated picture, here is the real Chavez, practically kissing Iran's Mahmoud Ahmadinejad. 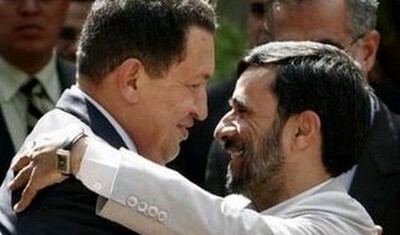 Hugo Chavez and Mahmoud Ahmadinejad, getting cozy. 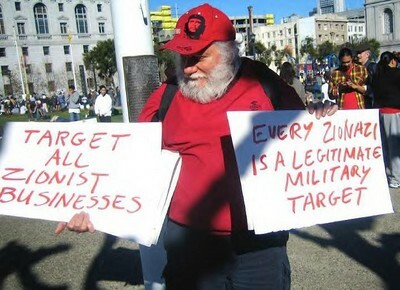 Jan. 10, 2009 update: A vicious anti-Israel demostration in San Francisco, captured in photographs and video by the brave "Zombie," includes a picture of a man wearing a Che Guevara cap and carrying two antisemitic signs, "TARGET ALL ZIONIST BUSINESSES" and "EVERY ZIONAZI IS A LEGITIMATE MILITARY TARGET." Mar. 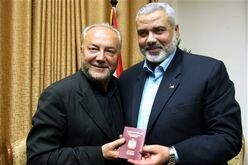 10, 2009 update: Ismail Haniyeh of Hamas, right, handed George Galloway of the UK a symbolic VIP Palestinian passport during their meeting today in Gaza City. 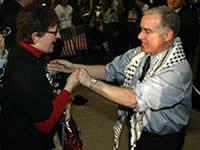 Respect and Hamas, in friendship. Jan. 11, 2010 update: Code Pink, a far-Left U.S. organization, placed an advertisement on the Muslim Brethren's website today, inviting the latter to "Arrest the War Criminals!" and "Join us in cleansing our country!" 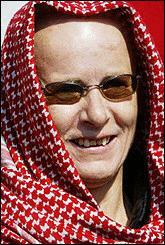 Code Pink appeals to the Muslim Brethren. 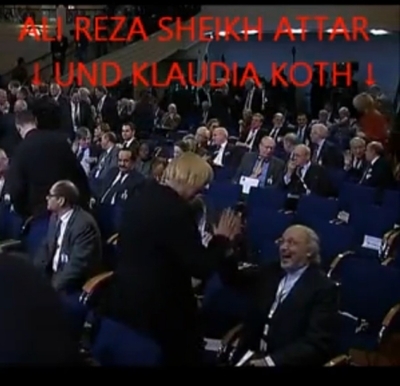 Feb. 11, 2013 update: Catch Claudia Roth, German Green Party leader giving the high-five to Reza Sheikh Attar, the Iranian ambassador in a video clip. Caught on camera: German Green leader chumming around with notorious Iranian ambassador.